The Spanish capital is known for it’s beautiful green spaces and its rich cultural history as one of Europe’s centres of art. Although the third largest city in the EU, Madrid boasts many micro-neighbourhoods, bursting with character and vibrancy, just waiting to be discovered. 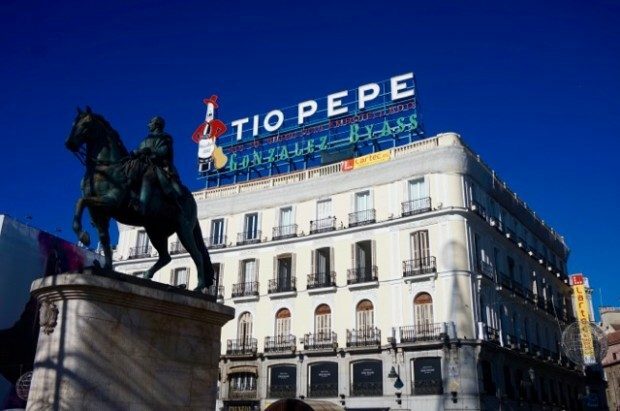 As both a political and cultural hub in the country, Madrid is the ideal place to experience the best of Spain and is one of The Luxury Editor’s favourite city-break destinations. Read more from our Eat, Do, Sleep guide to really get the best you can from this amazing city. 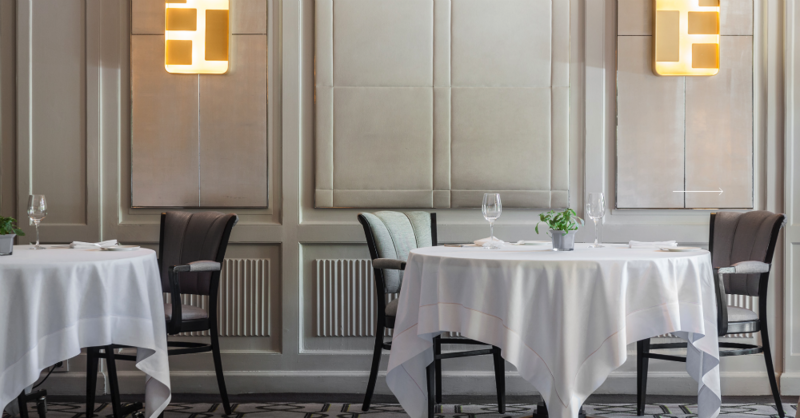 Etxeko Madrid is the latest Madrid venture from Spanish super-star chef, Basque born Martín Berasategui, bringing a taste of the north to the Spanish Capital. It is in collaboration with BLESS Madrid, the stunning new flagship luxury boutique hotel from Palladium Hotel Group. 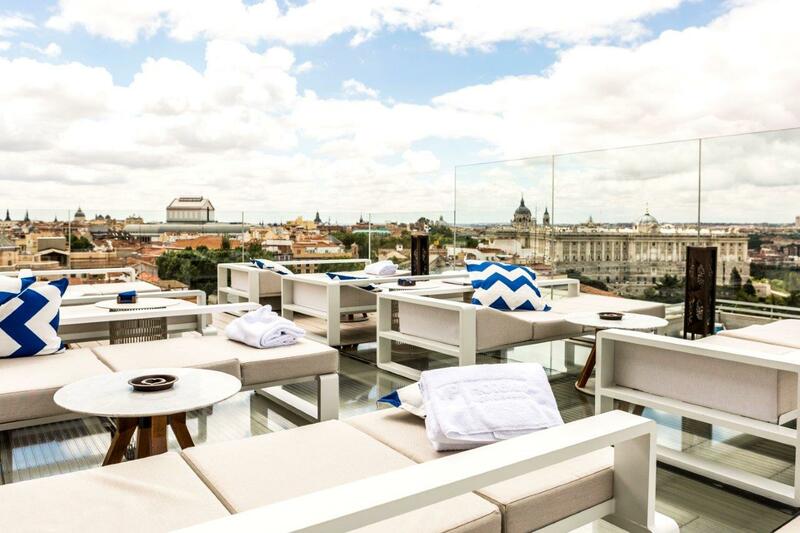 If you looking to enjoy the best sunsets, the best cocktails and the tastiest bites in Madrid, then we suggest you check out the newly opened Ginkgo Sky Bar. 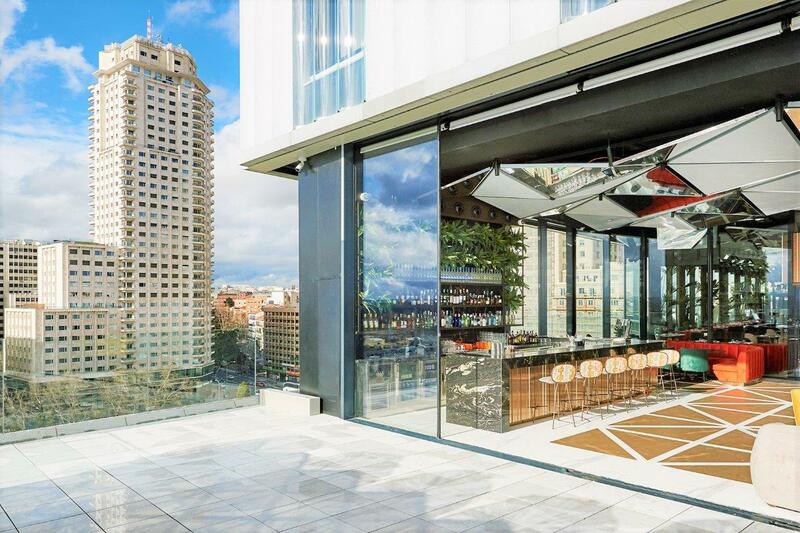 Madrid’s fabulous 5-star luxury hotel VP Plaza de España Design has created a new urban gourmet destination, on its 12t floor – the Gingko Restaurant & Sky Bar. Gingko Restaurant celebrates the best of Spanish flavours with an on-trend touch of Asia; whilst Gingko Sky Bar offers great cocktails, with live music. In fact, we believe that the Sky Bar is taking Madrid’s cocktail scene to new heights, with hipster mixologists that really know their stuff. The Vila Magna hotel is sophisticated and elegant so is it no surprise it’s gourmet dining establishment is similarly classy. Overseen by Executive Chef Amalio Prados, the restaurant focuses on procuring the best fresh and local ingredients to create a menu that emphasises seasonal foods. This is Spanish fine dining but with something for everyone. Stand out dishes include the fried octopus with basil, watercress and sorrel sprouts to start followed by the deep-fried monkfish with Frito, chorizo and garlic sauce. The dining room itself is a lesson in classic contemporary style with modern wooden paneled walls, art-like feature lighting and crisp white table cloths. This is the sort of place you just stumble across but if you take the time to look for it, this treasure is definitely worth finding. Bodega de los Secretos is tucked down a quiet side street and is formed by a maze of underground wine cellars dating back to the 17th century. The menu features some great modern Mediterranean classics including oxtail roll, Bluefin tuna, and grilled octopus. Don’t expect lots of room in a space that is more than 400 years old, but the intimacy of this architectural gem just adds to its charm. Our top tip? 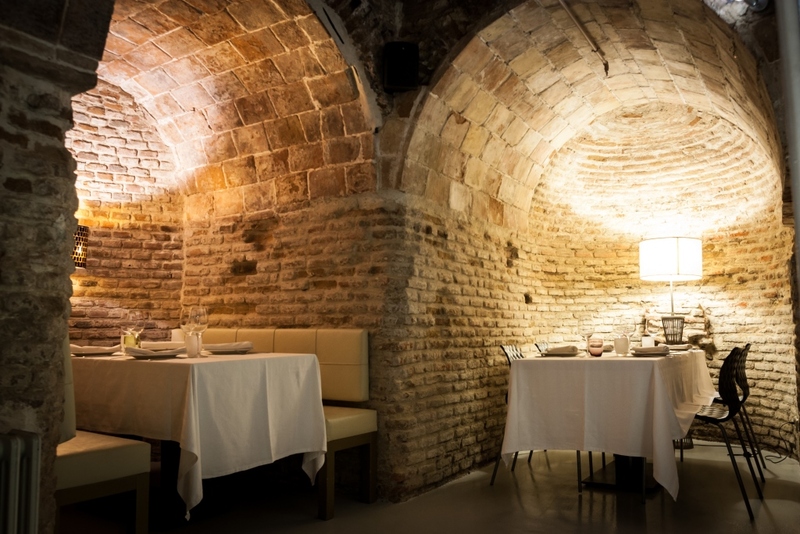 If you can, book a table in one of the super romantic arched alcoves. For one of the best views of the city skyline Azotea at the Circulo de Bellas Artes is unrivalled. 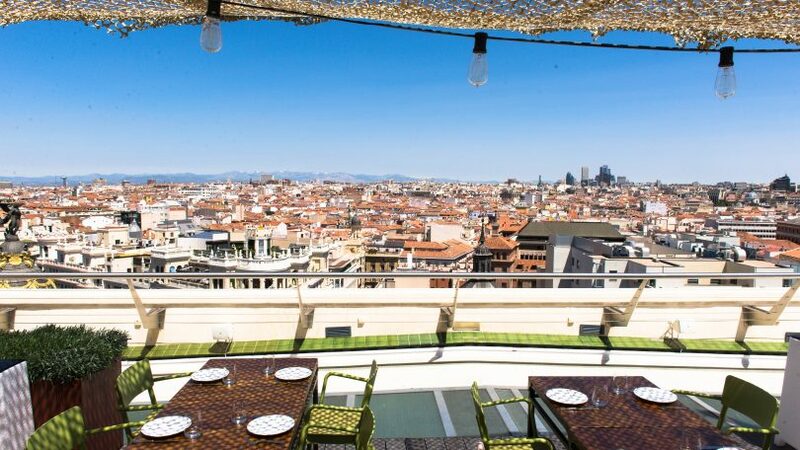 From the rooftop bar you can view a 360 degree panorama of Madrid, from the Sierra de Guadarrama to the north to the Cerro de los Angeles in the south. The Circulo de Bellas Artes is definitely worth a look around too, a building bursting with art, literature, interesting exhibitions and cultural workshops. Once you have had your cultural fill, ascend the glass elevator to the top floor of the building and be greeted with the beautiful urban landscape stretching out before you. 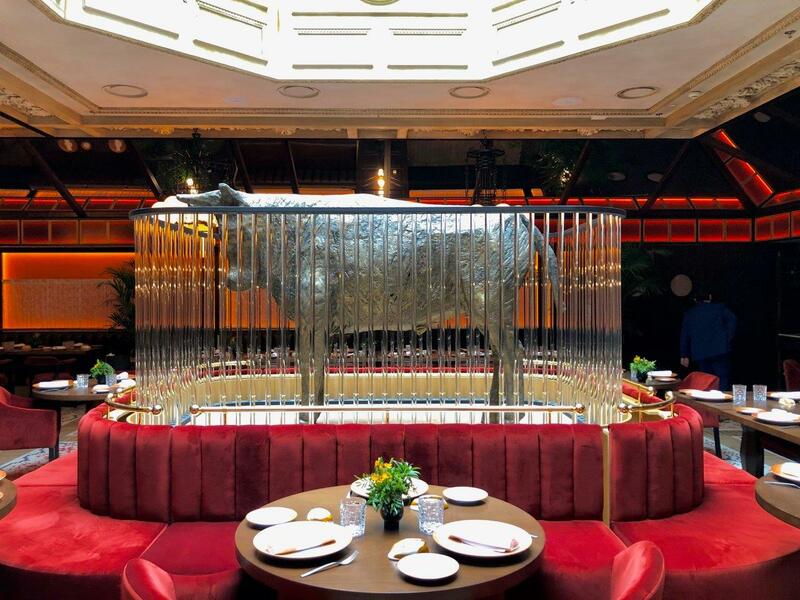 We recommend just heading up for cocktails but the TarTan Roof restaurant is a great date spot too! As one of the world’s premier galleries, any art aficionado worth their salt will want to see this place. But even if you aren’t an expert, the museum’s collection of more than 7000 paintings (of which only 1500 are currently on display) will have you mesmerized. The museum offers a unique look into Spanish history featuring works from masters such as Velázquez, Goya, Rafael, and Rubens. The building itself was originally the neoclassical Palacio de Villanueva, before becoming a cavalry barracks for Napoleons’ troops during their occupation of Madrid. In 1814 King Fernando VII decided the palace would become a museum for the extensive collection of royal artworks. Definitely purchase tickets in advance to avoid long queues outside the museum and if you are looking for a slightly quieter time to peruse the collection we recommend going between 2pm and 5pm to beat the majority of the crowds. Founder of Insider’s Madrid Joanna Wivell has been living and working in the Spanish capital since 1999. Take advantage of her varied knowledge of Madrid and book in for a private walking tour with her tailored to your interests. Whether you are a fashionista looking for the inside scoop on the best city shopping spots, or are interested in sampling as much of the best local cuisine as possible, Joanna can create a bespoke walking tour for you and your party. Meet the people of Madrid, discover the rich cultural tapestry of the city, and really get to know the history and architecture of the place in a truly personal way. Nestled in the basement of the old palace of the Count of Miranda in the Madrid de los Austrias area of the city, is Tablao Las Carboneras, a flamenco bar and restaurant reminiscent of the flamenco cafes of old, filled with dancing and singing. Many a prestigious name have graved the Las Carboneras stage including Pastora Galván, Jorge Pardo, Rocío Molina, Montse Cortés, Belén Maya, and Manuel Liñán. This restaurant is a sophisticated but relaxed place to eat, drink and enjoy some amazing contemporary flamenco, really immersing yourself in Spanish culture. Add some luxury to your flight to Madrid by buying a Priority Lounge Pass. 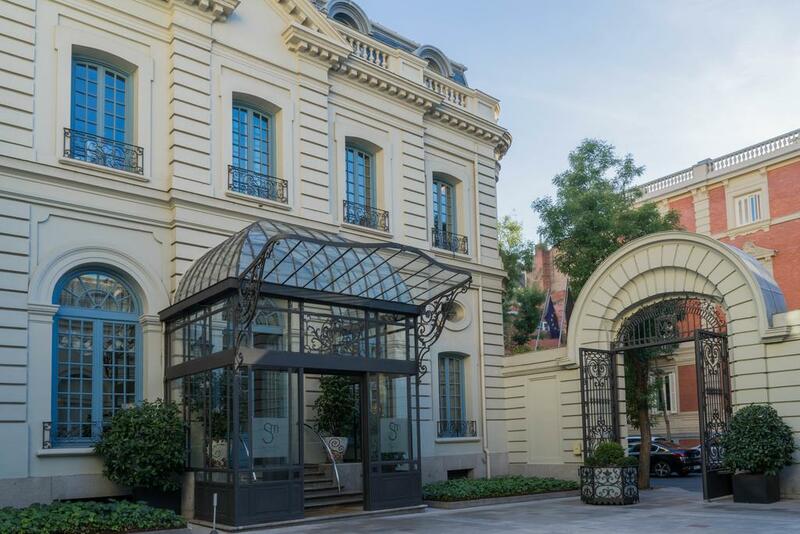 The 111-rooms BLESS Madrid Hotel (member of Leading Hotels of the World) is the flagship of a new collection of properties from Palladium Hotel Group. BLESS will include urban, as well as resort properties (BLESS Ibiza opens this summer). Striking interior design by Lázaro Rosa-Violán; cuisine by celebrated Spanish chef, Martin Berasategui, including his new Etxeko Madrid restaurant; spacious guest rooms and suites with bespoke ‘blessed beds’; Magness Soulful Spa; and Fitnic Power Gym. There are alluring public places to meet and share good times including the Versus Lively Lounge, a buzzing lobby bar & restaurant: the Fetén Clandestine Bar, in the basement, complete with bowling alley; and the Picos Pardos Sky Lounge. Want to live like a duke? The Hotel Santo Mauro can help you live out all of your regal fantasies as the former residence of the influential 19th century society member, the Duke of Santo Mauro. Located near Retiro park in the Chamberi area of the city, the Santo Mauro is a boutique hotel comprising of just 51 rooms, all entirely unique. The residence’s former ballroom has been renovated by interior designer Lorenzo Castillo to house the distinctive and bold lobby space which combines original features with contemporary furnishings. This hotel is popular amongst celebrities so don’t be surprised by the very chic clientele, sashaying around the opulent rooms and tranquil courtyard garden. Another former palace, this one dating back to the 19th century, the Only You Boutique Hotel boasts a myriad of original features from charming Juliette balconies to wooden window shutters and beautiful arched windows. The hotel stands apart for its striking award-winning décor, the work of designer Lázaro Rosa-Violán. The former central courtyard of the palace now forms the stunning 4-storied lobby space which is filled with beautiful light. Each space in the hotel has a different feeling without losing that impeccable taste and sense of fun characteristic to Only You hotels. Bedrooms combine 19th century architecture with modern-era artwork, furnishings and colour palettes. In terms of gastronomy the hotel boasts the YOUnique fusion restaurant, and for an aperitif choose between the sophisticated YOUnique lounge or the casual and vibrant El Padrino. Quietly popular with the stylish set, the URSO is a smart 5-star boutique hotel set slightly off the beaten tourist track. 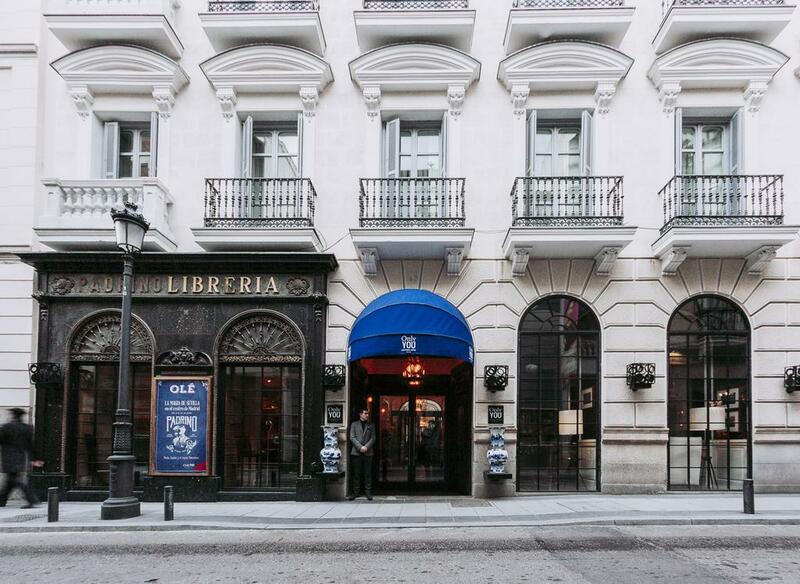 URSO is located in the sophisticated Salesas area of Madrid, an ideal spot for shopping, bar-hopping or simply enjoying a wander around, but still only 20 minutes’ walk from the bustling Puerta del Sol. Occupying an opulent palatial like building, the URSO has conserved many of the structure’s original features such as the amazing mahogany lift in the lobby and the impressive stained-glass windows. A tranquil colour palette of grey and creams dotted with delicate, detailed textiles keeps things calm and slightly old-school. Rooms are classic and unfussy but still with enough of a luxe touch to satisfy your inner a-lister. 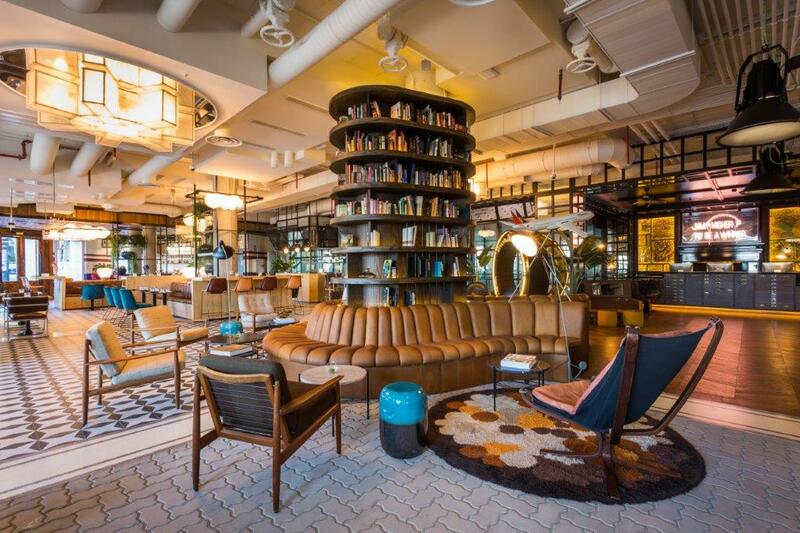 With an eclectic New York, industrial loft aesthetic, the Only You Atocha hotel brings metropolis urban cool to central Madrid. Much of the ground floor of the hotel is one large, open plan space. It is a seriously on-trend lobby and restaurant area created by acclaimed Barcelona-based interior designer Lázaro Rosa Violán. With 205 guest rooms, the Only You Atocha Hotel understandably has a wide selection of rooms suited to different budgets. All rooms share the same loft design, with wooden floors, exposed brickwork, and bold details from tartan throws. Expect a smart dressing table area; twin or king size beds; impressively fast Wi-Fi, widescreen TV with media hub connection to Bluetooth, HDMI and USB; kettle with teas; and, classic, mid-century modern styled bathrooms with generous showers, organic amenities, hairdryer etc. The flagship 5 -star luxury hotel, VP Plaza España Design, brings ultra-contemporary style to Madrid’s Plaza de España, close to the city’s historic and cultural hotspots.Through creative use of art, design and architecture, this sleek property has a distinct style and character, that runs through the hotel’s public spaces, it’s chic Biloba Spa; the 214 guest rooms & suites; as well as up to the stunning destination Gingko Restaurant & Sky Bar on the 12th floor. 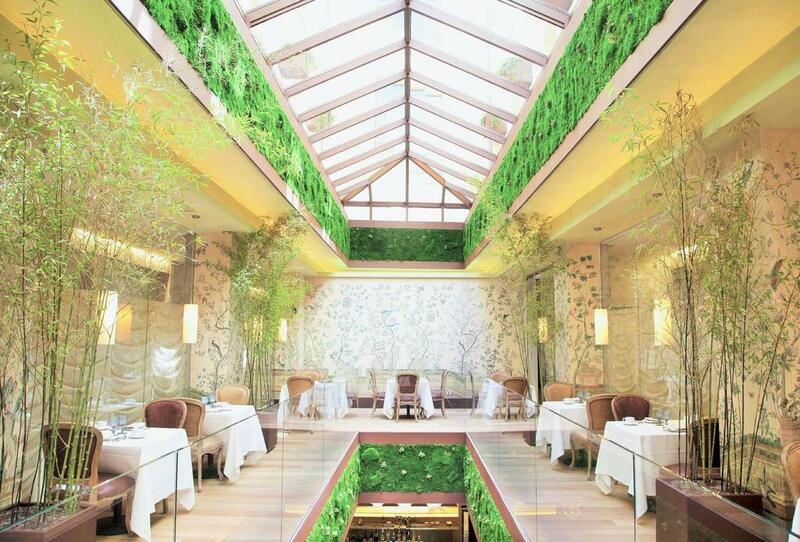 In addition, the hotel has the perfect Madrid Brunch spot, the Botania Restaurant found on the hotel’s ground floor, adjacent to the lobby. 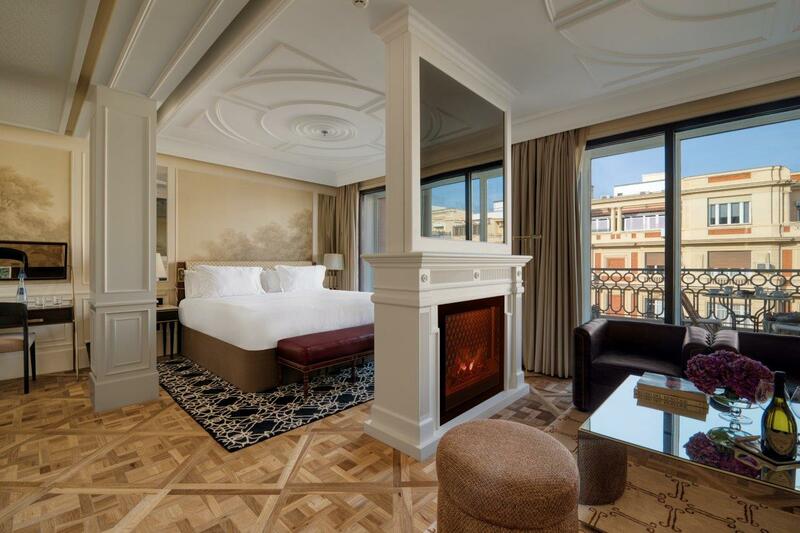 For more luxury hotels in Madrid, read our luxury hotel guide.